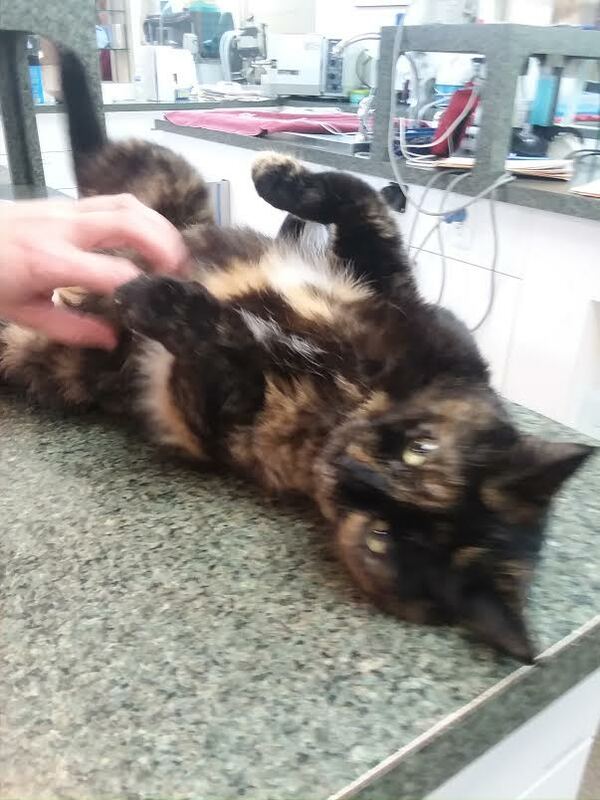 10/10/18 – PLACEMENT NEEDED – Last week Dr. Van at Patterson Veterinary in Clinton Twp., had a cat signed over to the clinic; the owners wanted the cat euthanized because she had fleas. Dr. Van contacted 4 Paws 1 Heart in hopes we could assist with placement. She is a beautiful 3 year old, spayed tortious shell that is very friendly and loving. 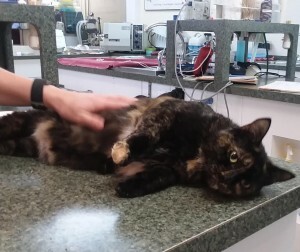 Dr. Van treated her fleas and dermatitis, tested her for FeLV/FIV (neg) and updated her vaccines. She is in perfect health and a really nice cat. 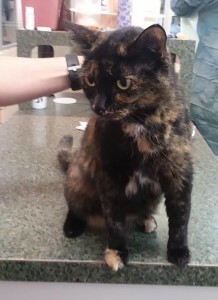 Unfortunately, the doctor cannot keep her or even foster her because her own cat is a bully and previous fosters have been miserable at her house. She ideally would need someone to foster her and hopefully someone to adopt her. She is living at the clinic currently but that availability is limited. Please let Dr. Van (or me) know if you’d be able to help. Dr. Van is willing to cover the expense of all the veterinary care she’s had and anything she needs further before adoption. Dr. Van can be reached through Patterson at 586-791-6260 – Thanks! This entry was posted in Abuse, Cats/Kittens, Medical Care by Diana. Bookmark the permalink. Did the tortie get a home yet? Also, where is she located?? How much were her vet expenses? I have not heard from the doctor. I know they were getting calls. The doctor said she would take care of the medical expenses if a good home could be found. Give Patterson a call to see if they are still looking.